Last year when we were walking Maria near the swimming pool at our condominium in the Cape Verdes, we rounded a corner and came upon a Podengo Medio, but in an unusual black colour with a white waistcoat. He was taller than Maria and very thin and underfed. The two dogs did not really take to one another although we think that they might be siblings from different litters. We called him Sooty. Sooty had a haunted look in his eyes and would always stand up and walk slowly away when we approached closer than 20 yards He seemed to be living under the restaurant, which is carried on piles over a rocky shore. In stormy weather the Atlantic pours in over the rocks, but whilst it is dry it was somewhere for Sooty to hide from people. We took him food and water but he would not touch these until we had walked well away. This meant that sometimes another dog that was loose but being fed would find it first. So we had to shoo away other dogs to give Sooty a chance. At first he was very weak. He spent most of the day wandering around looking for scraps of food and somewhere to drink. Dogs used to drink from the water that collected in the footwell of the fresh water swimming pool shower. But now the savages at the restaurant drive him away with sticks and stones. That is why he is afraid of all humans. We told dog friendly people to call him Sooty in the hope that he could distinguish between the humans and the savages who inhabit the condominium. During the day he would often hide behind a low sea wall, close to a rocky beach. But he forgot that his long black ears stick several inches above his head, so sometimes we would see just a pair of ears protruding over the wall. Eventually, he would reveal himself in the early morning and evening by standing on top of the wall after we had walked by with his food and water. But he would never allow us to come close. He did begin to play with other dogs that roam loose as he became stronger and healthier. We believe that there may be a pair of dogs living wild nearby, with the father perhaps black and brown and the mother yellow. Maria has rushed up to a dog like this, perhaps thinking it was her father. Both parents have elements of Podengo and Labrador, the two native strains in Cape Verde. They succesfully avoid humans, but every year one or at most two dogs from the annual litter survive and come looking for food and perhaps human company. We think that Jet in the Avatar, another Podengo type and also black and white may be a sister to Sooty. But she is now safe in Germany. She saved herself and her sister Niki who looks like a pocket Labrador by coming up behind me in the bar and chewing my hand. At that time the barman with the evil eyes used to shoo dogs away but did not dare to hit them when European were around. Niki was so weak that she just padded slowly around, but Jet helped her to get morsels from tourists. When we left we gave piles of food to an Italian restaurant owner and asked her to put out food for Sooty. She did for a while but when the food ran out, she must have stopped. She was already tending three dogs, one of which has only three legs, the result of being tethered by the leg, so she had little time for Sooty. We heard that he had disappeared and feared that meant dead. Brando had uncovered a shallow grave of a dead dog, just near the condo, doubtless poisoned with strycchnine by the manager, So we thought well they have now killed Sooty too. But apparently some other person in the condo is providing food and water. If anybody wants to help, there is a charity called Save Cats and Dogs of Cape Verde, which is doing its best to cope with the incredible callousness of the local inhabitants towards stray dogs. You can find it on Facebook. 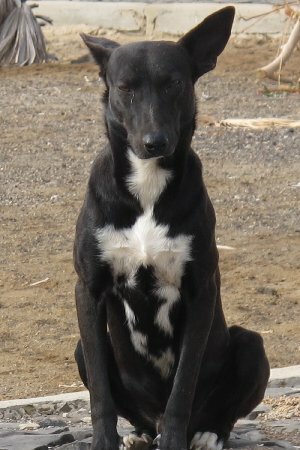 https://www.facebook.com/savecatsanddogsofcapeverde. It is run by Hannah from Finland. Sooty has been seen again by Jenny an English woman who has a house in the Cape Verdes. She sometimes puts water out for him. Otherwise the dogs that live partly wild on the condo have to drink from the water around the swimming pool shower. This is not easy as one of the waiters at the swimming pool bar will hit them and drive them away when no European is looking. Despite hs black colour, we consider that he is mostly Podengo - note his enormous ears and pointed snout - and probably a brother to Jet who is in the avatar. Jet now lives happily in Nuremberg, Germany.